Vision of the Tenth Eye is an Illusion spell that allows you to see objects that are otherwise invisible. It is used only during the Illusion Ritual Spell quest, and has no function outside of the quest. While under the effect of this spell, your vision will be distorted and monochrome. 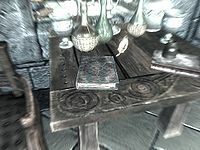 This effect will still occur if you cast the spell after the quest is complete, but no other objects besides the books in the quest will ever appear to you through the use of this spell. The spell provides night vision for its duration, though it has a short duration and is cast with both hands, limiting its usefulness. This page was last modified on 13 December 2015, at 12:09.